Somehow it got to be the middle of January without my really noticing it, and so this morning I got a note from the friendly folks at Trees of Antiquity telling me that my new apple trees are on the way. Which, of course, meant I had to panic and run outside to dig a hole. The ground is nice and soft right now because of our heavy rainfall. It's not so easy to dig right after a rain, being sand and all, but a couple of days later it's soft and light and a real joy to work with. I really don't miss digging in Berkeley clay at all. 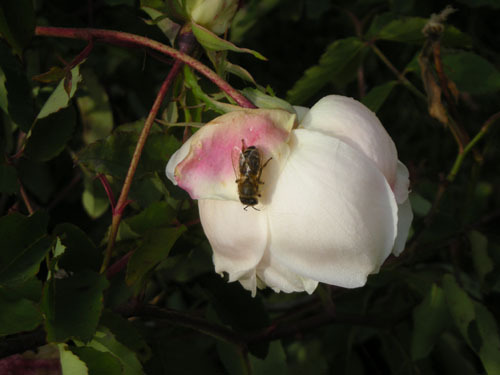 So I pruned the heck out of the rose, then went a little mad and ran around lopping large branches off various fruit trees (it was time for it, anyway), but eventually got round to removing the rose and digging most of my hole. 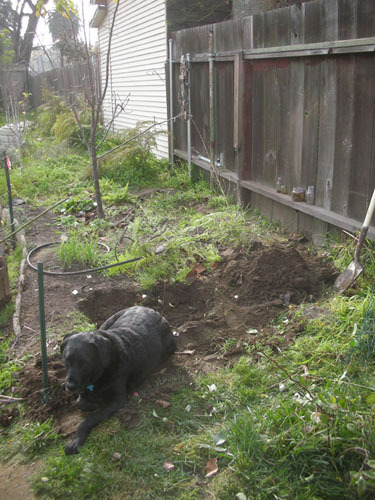 With Rosie, because apparently nice freshly dug dirt is a prime napping spot. 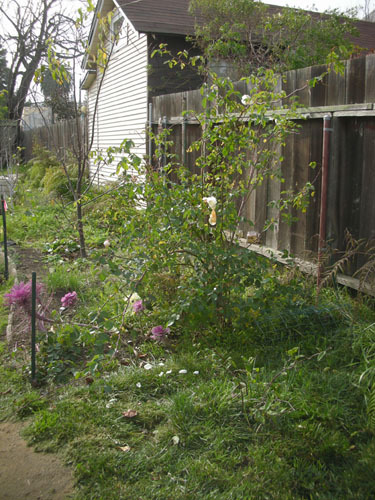 The rose will go along the back fence, once the back fence gets built. Until then it will sort of perch in this wooden planter, feeling unloved. 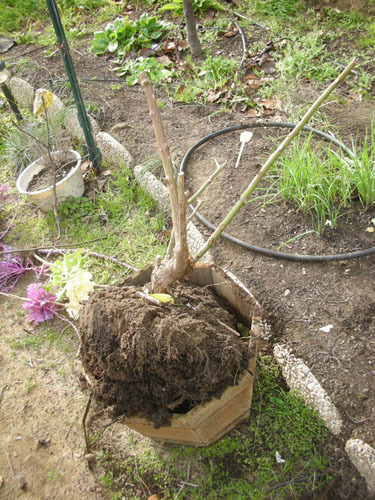 This is definitely not a container-sized rose, so it must be in the ground soon. 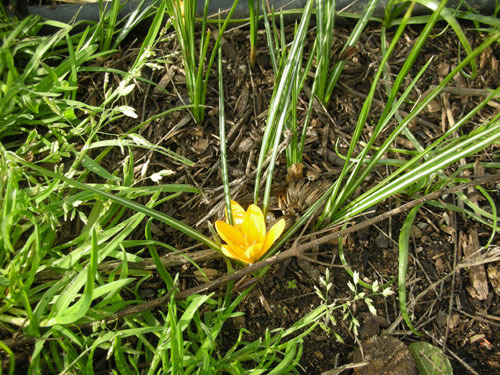 And now, because I know how January feels in places where there's actual snow, I give you "spring" in the garden: the first crocus. And of course the salvias are going like they never heard of weather. 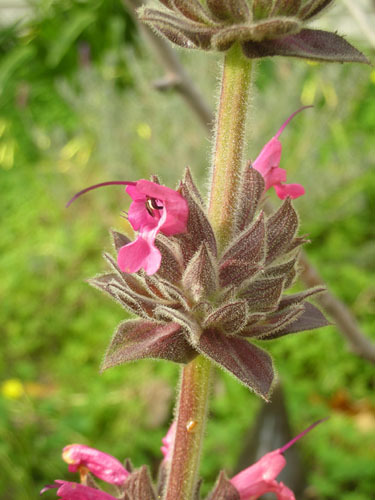 This is Salvia spathacea, "Hummingbird Sage," blooming near the older apple trees. I got this as a division from some friends in the North Bay. And finally, hanging out with me and checking out the pile of prunings from the rose was this little bee, who looks to be from our local feral bee hive. It was about 60F outside, so warm enough for bees to fly around, if not for them to have a lot of work to do. There's nothing better than a fresh pile of dirt! Nothing. Your pup has the right idea! Aw, flowers! It'll be months before I see any here, and I have no idea if the previous homeowners planted crocuses (crocii?). If not, I shall remedy that next fall.